Plot - After nine year Jesse and Celine met each other unexpectedly on the French leg of Jesse's book tour. Jesse Wallace to promote his best selling book is in Paris bookstore. He want to tell about the source of the book, earlier nine years ago on June 15-16, 1994 with Celine (Parisienne) who is stranger to him they spend the memorable and romantic moment with each other in Vienna. At end of their encounter in Vienna train station, they don’t provide any contact information to each other and excited to meet each other at the same place after six months. In the crowd Jesse spots Celine and she the only one who found the book when she saw his photograph promoting this public appearance. Like last encounter both of them decided to spend time with each other until he supposed to catch his flight to New York. 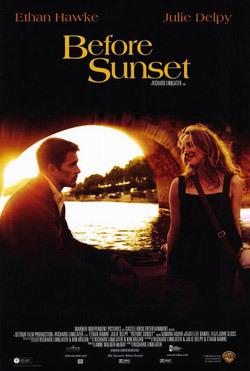 Awards & Nominations Won by "Before Sunset Movie"
Box Office Earning of "Before Sunset"